Kerrie Paterson writes contemporary women’s fiction and small town / rural romance – stories about women in their 40s and above who have reached a crossroads in their life. She loves to write about women’s relationships with their friends and family, as well as their romances. Her manuscript ‘Elsie’s Place’ came 2nd in the 2014 Ripping Start competition. In 2015, she finalled in the 2015 Emerald with a 3rd place for ‘Polly’s Patisserie’. In 2016, her novel Reach for the Stars was nominated for a Ruby Award in the Short Sweet category. She was also voted ARRA’s Favourite New Romance Author in 2015. When she’s not writing, she’s a Scout leader, crew for a local drama theatre, taxi driver for her teenage son and keeper of the family knowledge (aka ‘Mum, have you seen my camera / phone / cable etc?’). In her spare time (ha! ), she’s a yoga student, keen photographer and avid reader. 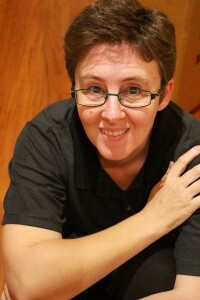 Kerrie is a proud member and volunteer of the Romance Writers of Australia and the Hunter Romance Writers. She lives in the Hunter Valley, Australia.